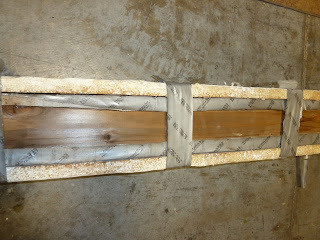 I'm working on the part of the Aleutian Kayak that has to do with bending wood. And so I went and took some pictures of old steam boxes down at the shop. They're not really that old. They've been used maybe a dozen times. But they've sat outside for a year and the effects are starting to show. Which got me to thinking, what is it about them that makes them look third world. Certainly, pictures like these don't inspire confidence in someone from a first world culture who is used to shiny plastic tools and chrome etc. There are even whole websites devoted to making fun of people who improvise temporary or permanent solutions in the home fixit department. And I don't know if it's still on the air, but there was this TV show out of Canada called The Red Green show about two guys who did a lot of fixes with duct tape. Here's another picture, this one a closeup on an 8 foot long steambox for heating wood for coamings. So why do these things look so third world? I suppose the duct tape is a big factor, as is the foam insulation, as is the weathered look from sitting outside. 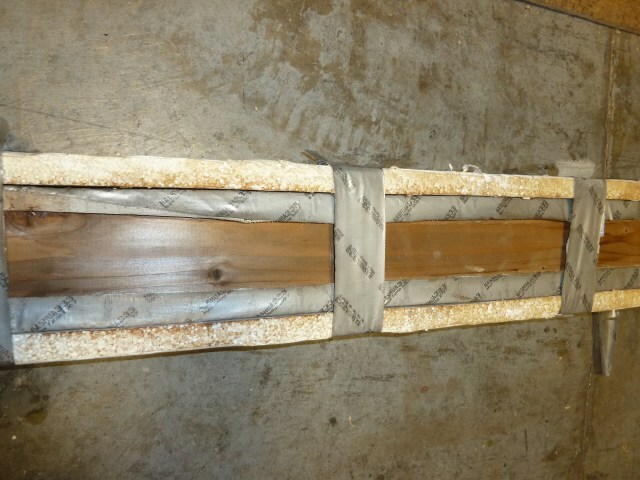 The foam is starting to come apart, the duct tape is failing and the wood is turning gray and splitting. So what is it that makes us contemptuous of this sort of thing? All I can say is that it has to do with money. The rich have contempt for the poor. The poor manage as best they can given the resources that they have. The rich hire someone to do things for them. And they have money for big houses with lots of storage and big lots for erecting sheds that keep stuff out of view and out of the sun where it starts deteriorating. The third world builder on the other hand has to store some stuff outside because he has no inside storage and so the sun and rain start to go to work on his stuff. And the third world builder is not that interested in the stuff itself. His stuff is a means to an end, not a status symbol. So what's my excuse for having steam boxes that look distinctively third world? I guess the reason is that a lot of the stuff I build is provisional. It is a first cut. I build, not being sure if the thing will even work, so I don't invest a lot of time and resources in it. The steam boxes were made out of whatever was laying around at the time. 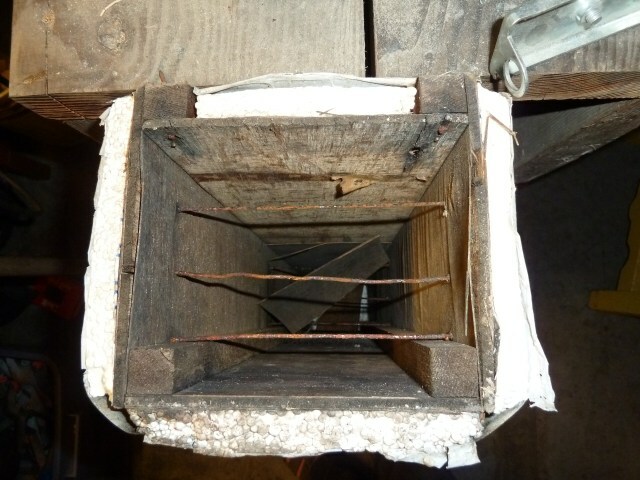 The long steam box was made out of 3/4 inch lumber and some 1/4 inch paneling. The 1/4 inch paneling was too thin and leaked out too much heat so the box never got hot enough. Hence the insulation taped to the outside of the box. It is now fully functional. But it has spent some time outside after the latest move and the sun is starting to do its work. So what's the lesson here? One is that 3/4 inch wood or even better, exterior plywood all around is optimal, both for standing up to the steam and potentially, outside storage and for holding the heat in. The foam insulation works as well but starts looking shabby after a while. So freshen it all up with duct tape every so often until it falls apart. So the life span is maybe half a decade with a minimal outlay of time or money. If I wanted to go to the lumber yard and get 3/4 inch plywood, that would give me a steam box good for at least a decade, if not more. The downside is the trip to the lumberyard and the pain of lifting a four by eight sheet of plywood. That stuff weighs a ton and is the kind of thing that leaves your back hurting for days after you lift it on top of your car. So who knows, the third world solution has a lot of appeal, not the least of which is that your scrap pile gets smaller, not bigger as it would if I went to the lumber yard and picked up a full four by eight panel of plywood.